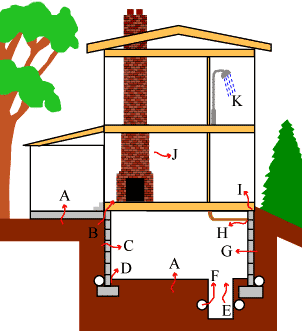 How Does Radon Enter the Home or Building? Radon is a naturally occurring radioactive gas produced by the breakdown of uranium in soil, rock, and water. Air pressure inside your home is usually lower than the pressure in the soil around your home's foundation. Because of this difference in pressure, your house acts like a vacuum, drawing radon in through foundation cracks and other openings. Your home then traps the radon inside, where it can build up. Any home may have a radon problem. This means new and old homes, well-sealed and drafty homes, and homes with or without basements. Radon may also be present in well water and can be released into the air in your home when water is used for showering and other household uses. In most cases, radon entering the home through water is a small risk compared with radon entering your home from the soil. In a small number of homes, the building materials (e.g., granite and certain concrete products) can give off radon, although building materials rarely cause radon problems by themselves. In the United States, radon gas in soils is the principal source of elevated radon levels in homes. A. Cracks in concrete slabs. B. Spaces behind brick veneer walls that rest on uncapped hollow-block foundations. C. Pores and cracks in concrete blocks. E. Exposed soil, as in a sump or crawl space. F. Weeping (drain) tile, if drained to an open sump. H. Loose fitting pipe penetrations. I. Open tops of block walls. J. Building materials, such as brick, concrete, rock. Nearly 1 out of every 15 homes in the U.S. is estimated to have elevated radon levels. While radon problems may be more common in some areas, any home may have a problem. The only way to know about your home is to test.